Projects may have potential impact on geology, soils and paleontological resources. The Paleontological Resources Preservation Act (PRPA) states that paleontological resources may not be collected from federal land without a permit issued by the Secretary of the Department of the Interior. However, the PRPA contains an exception that allows casual collecting of reasonable amounts of common invertebrate and plant fossils from federal land controlled by the Bureau of Land Management for non-commercial use without a permit. ‘Casual Collecting’ under PRPA includes surface collection or the use of non-powered hand tools resulting in only negligible disturbance to the Earth’s surface and other resources. It maintains a prohibition on the sale of common invertebrate and plant fossils. A paleontological resources use permit is required if the activities cause a disturbance to the surface that could cause impacts on other natural or cultural resources. 16.1 to 16.2 Is the Project on Federal Land? 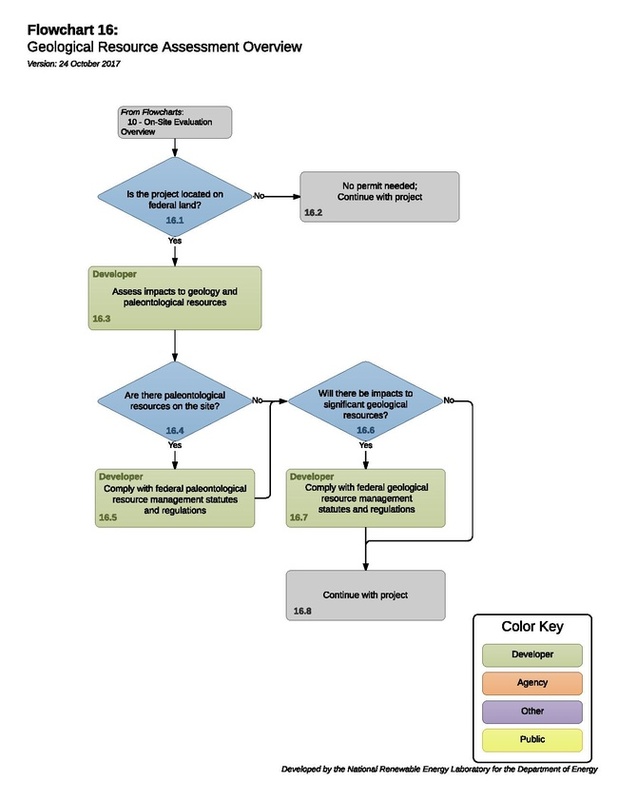 As an initial consideration, the permit described in this flowchart only applies to projects located on federal land. When on private land, developers may impact geology, soils, and paleontological resources without a permit. When on state land, the developer may need to abide by certain rules and restrictions, typically contemplated as part of a cultural resource assessment. If not on federal land, the developer may continue with the project. The developer must assess the potential impacts the project may have to geology, soils and paleontological resources. 16.4 - Are There Paleontological Resources on the Site? If there are paleontological resources on site, then a permit or other action may be required. Consult the Paleontological Resources Preservation Act for detailed information. The Act continues to allow casual collecting of reasonable amounts of common invertebrate and plant fossils from public lands for personal use without a permit. The prohibition on the sale of common invertebrate and plant fossils will continue. In addition, the PRPA does not change the BLM’s requirement for issuance of a paleontological resources use permit for the collection of vertebrate and other invertebrate and plant paleontological resources that are of paleontological interest to qualified researchers. 43 CFR 8365.1-5 states that it is permissible to collect from public lands reasonable amounts of "nonrenewable resources such as rock and mineral specimens, common invertebrate and common plant fossils, and semiprecious gemstones" for noncommercial purposes. According to 43 CFR 3622, persons may collect limited quantities of petrified wood for noncommercial purposes under terms and conditions consistent with the preservation of significant deposits as a public recreational resource. No application or permit is required unless the specimen weighs over 250 pounds. As a type of government property, fossils are protected under 18 USC 641. A paleontologist must have a valid paleontological resource use permit before collecting or disturbing fossil resources on BLM-administered lands. Casual collecting (also called hobby collecting) of certain common invertebrate and plant fossils on BLM-administered lands is allowable without a permit. must provide a valid and current repository agreement with a Federally approved museum repository. Paleontological Resource Use Permit Application. 16.10 - Will There Be Impacts to Significant Geological Resources? If the project will result in impacts to significant geological resources, then additional permitting and other action may be required. The Federal Cave Resources Protection Act works to protect, secure, and preserve significant caves on federal lands. A "cave" is defined by the act as "any naturally occurring void, cavity, recess, or system of interconnected passages which occurs beneath the surface of the earth or within a cliff or ledge...and which is large enough to permit an individual to enter, whether or not the entrance is naturally formed or manmade." The Secretary of Agriculture or the Secretary of the Interior ("secretary") is authorized to issue permits for the collection and removal of cave resources under terms and conditions developed by the secretary. The secretary may issue a permit only if he determines that the proposed collection or removal activities are consistent with the purposes of this act. See Federal Cave Protection Act of 1988. 43 CFR 1610.7-2 sets out the rules for designating areas of critical environmental concern (ACEC). Areas with potential for ACEC designation and protection management must be identified and considered throughout the resource management planning process. If there will be no impacts to significant geological resources or if the developer has satisfied the requirements of any applicable regulations, the developer may continue with project. This page was last modified on 29 August 2018, at 13:22.